We are all here to explore this concept of self-awareness, this concept of purpose. We are all here to explore this concept of self-awareness, this concept of purpose. We’re not here to answer the question of purpose. There is no one definable answer, there is only the concept of self-awareness, and what it means to have ‘purpose’. “The Fabric of the Cosmos,” a four-hour series based on the book by renowned physicist and author Brian Greene, takes us to the frontiers of physics to see how scientists are piecing together the most complete picture yet of space, time, and the universe. With each step, audiences will discover that just beneath the surface of our everyday experience lies a world we’d hardly recognize—a startling world far stranger and more wondrous than anyone expected. Brian Greene is going to let you in on a secret: We’ve all been deceived. Our perceptions of time and space have led us astray. Much of what we thought we knew about our universe—that the past has already happened and the future is yet to be, that space is just an empty void, that our universe is the only universe that exists—just might be wrong. Interweaving provocative theories, experiments, and stories with crystal-clear explanations and imaginative metaphors like those that defined the groundbreaking and highly acclaimed series “The Elegant Universe,” “The Fabric of the Cosmos” aims to be the most compelling, visual, and comprehensive picture of modern physics ever seen on television. Dear Mytrian, it is true that we shall guide you back into Gaia’s core to recalibrate the Cornerstone Crystals within that NOW. However, first we need to give you some more information about our multidimensional inter-galactic group mind and about the timeline you are entering. Before you entered the timeline in which Gaia was first manifesting Her New Earth. You greatly assisted that manifestation by supporting the Lemurians to heal the psychic scar caused the sinking of their civilization. Now you will enter Gaia’s core during the timeline of year two of New Earth. First, we wish to tell you more about the team of our inter-galactic group mind. Because we resonate to the fifth dimension and above, we meld our minds in total unity with each other and with the ONE. It is this fifth-dimensional unity consciousness that we are teaching to our many emissaries on Earth during the timeline you will be visiting. You are called upon to assist in re-calibrating Gaia’s core crystals to activate her multidimensional matrix. This re-calibration will facilitate the transition from a third dimensional planet into a multidimensional planet with multidimensional inhabitants. Our inter-galactic team has many emissaries who have volunteered to wear a physical form to assist with this process of planetary ascension. We are in constant communication with the emissaries who have awakened to their SELF, and more of them are awakening every day. Once fully awake to their true multidimensional nature, our emissaries are able to consciously receive the light messages that we are sending. Some of the emissaries will translate our messages into words. Others will translate our light messages into ideas, actions, writing and other forms of creative expression. Some of our emissaries will receive our messages from others who have translated them, but they will instantly resonate to the information. Then they will want to know more because it will awaken them to the knowing that they, too, are emissaries of light. Many of our emissaries will also become involved in the communications and actions, which other emissaries have stepped down into the third dimension. However humanity receives our message and in whichever way they share it was predetermined before they merged their essence into an earth vessel. It is your mission to assist our “away team” who has downloaded their essence into one, or several, of their third dimensional expressions of SELF. The cetaceans and many members of the ‘animal kingdom’ are also receiving their higher dimensional essence of SELF. Once these earth-bound expressions have fully integrated their higher expressions of SELF, it is vital that they become involved in Gaia’s ascension, which is occurring NOW. The caterpillar inside the cocoon does not see a difference in its outer world until it becomes a butterfly. In this new form the world can be perceived from a vastly different perspective than it was from the viewpoint of a caterpillar. Many of the members of our brave away team have become trapped in the perspective of their grounded self who must walk upon the land rather than beam through dimensions. Fortunately, as they awaken to their Multidimensional SELF, they will be able to experience their physical form on Gaia’s landed surface while they simultaneously experience their ascended form as members of our inter-galactic family. Just as their human self may be French, German and Italian, their Galactic SELF may be Sirian, Pleiadian and/or Arcturian. If our emissaries are able to connect with one of the many higher expressions of their Multidimensional SELF, they will be able to serve us as a translator of our message. We are aware that Earth’s culture has been separated into many different languages, beliefs and spiritual/religious ideations. However, planetary unity consciousness is vital for the planetary ascension. The remaining forces of darkness have created propaganda to create myriad wars and conflicts to avoid the inevitable planetary unity consciousness, as they know ascension will end their reign of fear. The end of their reign will NOT come about through yet another war, but via worldwide unconditional love and unity consciousness. In fact, unity consciousness creates unconditional love and unconditional love creates unity consciousness. Humanity begins this process when they unite with their Multidimensional SELF. As they unify their consciousness with more and more of their multidimensional expressions of SELF, their consciousness will expand beyond the illusions of the physical world. Once they are fully aware that they are also a higher dimensional galactic or celestial being, their human identity will no longer be bound by 3D illusions. In other words, once they are fully aware of their inner multidimensional identity, their third dimensional earth vessel will be perceived as their anchor into the body of Gaia. Through this “anchor” they can pull the multidimensional light of their SELF through their earth vessel and into the core of Gaia’s Earth. Therefore, Mytrian, do you see why you are so important. You are a prototype for a physically grounded multidimensional being. Your inner expressions of 3D Sandy and Jason also hold two separate physical bodies on ascending Earth. Your inner expressions of Mytria and Mytre hold expressions that appear “separate” from the perspective of your third-dimensional thinking. However, you have fully integrated these components of your inner and extended Pleiadian SELF. On the other hand, you inner Arcturian SELF still appears to be far beyond the being that you perceive as YOU. All members of our inter-galactic team have merged into this unity consciousness with higher expressions of their Multidimensional SELF. It is through their connected multidimensional consciousness that they can receive our higher-dimensional light message and translate them into a manner which can be received and understood by the awakened members of Earth. Our inter-galactic group mind unites myriad dimensional expressions of SELF as well as our human expressions on ascending Earth. Unfortunately, many of our third dimensional expressions have forgotten that they are already ascended within the higher octaves of their Multidimensional SELF. Therefore, they may have forgotten that they did not take an earth vessel in order to ascend that vessel. They volunteered to assist Gaia with the ascension of Her planetary form. This planetary ascension will occur via unity consciousness of Gaia’s inhabitants. The lost ones who have become trapped in their own darkness are terrified of unity. Many of these lost ones cannot ascend into the higher realms because their actions were so vicious that they separated themselves from their Multidimensional Soul. However, they are still on the fourth dimensional Wheel of Birth and Death. Therefore, when they “die” in the third dimension they go into the lower worlds of the fourth dimension to later be “born” back into the physical plane. This group of lost ones is actually quite small and ranks only in the thousands. However, they have been in power for so many millennia that they have created a huge network of others who were brainwashed to follow the lost ones orders. To be afraid of any of these lost ones only feeds them, as they actually devour fear. On the other hand, unconditional love is quite terrifying to them, as that frequency of light can actually damage them. Of course, once anyone would have the intention of using unconditional love to damage another, their frequency would drop, and they would no be able to send such a high frequency of light. Instead, unconditional love serves as a shield, which actually makes you invisible to the lost ones. Just as many of our away team cannot perceive their higher expressions of SELF while wearing their third/fourth form, the lost ones cannot perceive any thing that resonates beyond the mid-fourth dimension. Mytrian, before you return to the lower dimensions, we want to remind you that unconditional love infinitely protects you from all darkness. You do not need to send out that unconditional love. Instead, just hold it within your consciousness. Keeping unconditional love focused in your consciousness will assure protection against adversity. Before entering Gaia’s core you will visit your earthy expressions of Mytre and Mytria to fully integrate that frequency of your Multidimensional SELF. This integration may be a challenge. However, once you call upon your higher expressions, you rise above any difficulty to regain your higher perspective. Greetings we are the Council of Angels, Archangel Michael and the Pleiadian Council. We wish to speak to you of the Pleiadian Technologies, and high technologies of the other star nations in your universe, that we will be bringing to your societies after our Grand Reunion. These technologies are an incredibly advanced alternative to many of the ways that your society functions; which in many ways are archaic compared to the advanced higher dimensional technologies we use in our dimensions. The first and most important technology which we will present to you is a healing chamber which the channel has experienced before in a meditation with us. We invite you to connect in with us of the Pleiadian Council at any time to experience this for yourselves. We are able to assist you to heal in one of these light chambers in your own home as we will bring the technology to you. Keep in mind this will take place initially with your light body and in meditation. The method to connect in with us is to first connect in with your higher self. This is done by closing your eyes, breathing deeply, and being in a quiet space, then saying in your mind “I connect with my Higher Self, please connect with me.” Your higher self is the part of your being that lives in the higher dimensions which is very close to the Creator Source of All. Your new multidimensional self is a new facet of yourself that is being created from the “merging” of your higher self with your lower self on earth. This, then, forms into your multidimensional being. This is the being that is a part of this ascension process that many of you are going through on earth at this time. So after connecting in with your higher self, it is always a good idea to also connect in with your Multidimensional self which you are in the process of creating in the NOW moment. To connect with your Multidimensional self is a similar process to connecting in with your higher self. You may get a vision of your Multidimensional self which lives outside of time, living in a new environment. 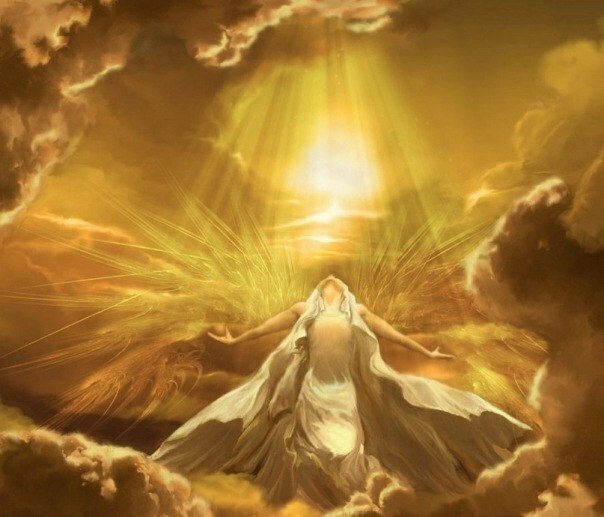 The channel has a vision of this every time she connects in with her higher self she can see things from the viewpoint of her multidimensional self and she is then able to establish a connection between her current “lower self”, her “higher self” and this new Multidimensional Being that she is creating. You can visit with your multidimensional self at any time and you will find that this is quite beneficial to learning to live outside of time as this is the realm in which your multidimensional self lives, in the higher dimensions outside of time. It is a very freeing feeling to be living outside of time. We, The Pleiadians and all of the other higher dimensional star nations live outside of time as well. This is how we are able to see things that may not yet have occurred in your present “timeline”. We have access to all that is happening simultaneously. You, too, will be able to access this as you continue to grow into your multidimensional self. So back to connecting with us to assist you in our healing chamber, after you have connected in with your higher self and your multidimensional self, you can then just relax into a space of light and then connect in with us. Or, you may wish to connect in with your original star family which you are all in the process of connecting into and becoming aware of now, as many of the other star nations have healing technology as well. But for now we will speak of connecting in with us if you feel drawn to our energy. To connect in with us, is the same process as connecting in with your higher self and multidimensional self, simply say “I connect with the Pleiadian Council, please connect with me.” We will then introduce ourselves, those of us who have chosen to show up at that moment for you. We speak from a collective because our higher dimensional societies have a certain protocol of Unity and Oneness in which we function together for the higher good of the whole, for the Good of All. This is why much of your earth world is so foreign to us, for those of us who have never incarnated there; because we cannot conceive of a society that does not function for the Good of All. Your earthen society is now in the process of moving towards this, and this process is accelerating rapidly as “time” goes on, because the higher frequencies around and within your earth continue to raise in octave levels to be a higher and higher frequency; this is why your bodies often feel like they are “humming” or you may hear a higher frequency sound that seems like it is a ringing in the ears but really it is just your minds bodies and souls connecting into and becoming more and more aware of this higher frequency vibration. It is also a sign that your mind, body and soul are raising in frequency which a large part of your ascension process; the council of angels have described it in the past as a “harmonizing with the higher dimensional frequencies” so this is a similar description. So, then, after connecting in with us, you will meet those of us who choose to show up for this gathering and you may then ask that we assist you with healing a particular issue that you may have whether it is physical, mental, emotional, or any type of issue that needs to be healed. We will then bring our higher dimensional ships to you; into your etheric space so to speak (you will see us in your mind’s eye in this meditative state you are in but will most likely not “see” us with your physical eyes until your vibrations are raised to a much higher frequency and until first contact has been made with your societies.) Remember we have also spoken in the past of the method in which we communicate, is telepathy; so therefore this will be how we communicate with you during this meditative healing session. After connecting with us, being introduced to us, and then asking us for assistance with healing, you will then sense or see in your minds eye that we have come into your space. You will feel our unconditional love and harmony surrounding you, and may “see” our ship in a sort of translucent way integrating into the room you are in. We will then help you to “be” in our light chamber at which time you will feel a sense of loving, caring energy, golden light, and a deep sense of peace, calm and well-being. You may relax now into your healing session. You are in control of this experience. The only way we will come to assist you with this is if you ask, for we cannot and will not interfere with your free will at any time; and come only when asked. Keep in mind this is generally true on the larger scale of things as well, and our Grand Reunion will occur when enough of the earth’s population has asked for this Grand Reunion with your star families; you may connect in with your star families at any time and ask for this reunion to occur. Many of you are of Pleiadian origin, and many from other star nations. This has been written about elsewhere but we will expand upon this later. Suffice it to say that you will all be coming into a great awareness of your lives beyond this earth life and will begin to resonate with one or more of the many star nations surrounding your earth in ships at this time. Remember we are existing in the higher dimensions (5th and beyond) and therefore you cannot see the extraordinary number of ships which hover just outside, and many times inside, your earth’s atmosphere. Even Comet ISON is a great flotilla of ships attached to a large mothership; this mothership can change its appearance at any time, disappearing and reappearing at will. This we can do with all of our ships; they are controlled with our consciousness not with simple electronics; they are highly advanced craft which operate on some of our most advanced technologies. So back to your meditative healing experience; we wish for you to take advantage of this free healing technology which we are now offering you to take part in during your meditations. We can heal you in the etheric realms oftentimes more easily than in your physical realms because many diseases start in the etheric body and trickle down from there. So relax into this beautiful light chamber of healing and enjoy your meditative healing experience in our advanced light chamber. Each person’s experience will be different but all are welcome to enjoy our higher dimensional healing technologies at any time. We are just a meditative moment away. Enjoy this beautiful light-filled and loving experience! You may wish to keep a journal of your higher self connections, meditations, messages, and of your healing journey and connections with us or with your star family. If you are unclear on your star family origins, begin to tune into your higher self on a frequent basis and begin a dialogue with your higher self. All of the answers are within you, you only have to simply tune into your higher self to receive them. All is Within and your connection to the Source of All, the Great Creator, is also within, for you are a spark or a part of this Source Creator and have all of the abilities of Source Creator, many of which you are unaware of. We will speak of this in a future message. We of the Pleiadian Council will also be discussing many of our other higher dimensional technologies in our future messages to you. Until then, enjoy and have fun! Life in the higher dimensions is filled with joy, presence, awareness, and a lightness of being. Each person has the ability to tune into their higher self and the higher dimensions, and to establish and strengthen a communication with us, your star families, your higher self, your multidimensional self, and with the archangelic realm. We invite you to partake of all that is now readily available to you. Enjoy this beautiful light connection and we look forward to being with you on your higher dimensional journeys. We are, the Council of Angels, Archangel Michael and the Pleiadian Council. Channeled by Goldenlight, http://www.thegoldenlightchannel.com. © The Golden Light Channel. Please include this copyright and credit, original title, and a link to the source message when re-posting this message. Here you are at the end of yet another year that has been momentous in many ways. Time has continued to speed up, and a clear division can be seen to be taking place between the old and new. The dark Ones are not progressing as they would have wished, after feeling that they were on the verge of taking control of the world. They reckoned without the increasing amount of Light that has been grounded upon Earth. So much so, that almost unnoticed it has become the most powerful force for good. No longer can its progress be delayed, and it is destined to be the means of removing the dark Ones. This cycle has completed its course and the Light is now the dominant force upon Earth. The apparent turmoil is but a sign of it restricting the ability of the dark Ones, to continue their onward march to world control. It was always planned this way so that no matter how much they extended their power over the people, they would never achieve complete control. The cycle has run its course and a new one has commenced that will bring complete peace and happiness to all souls. There is no longer a place for the dark Ones to wield their power over the Human Race. As you stand fast and are not affected by the outside occurrences, so you empower the Light that grows ever stronger. Live in the Light, and you can live your life in a way that helps lift others up with you. The coming New Year will herald many changes that will send out a strong signal that the Light is bringing the New Age into being. 2014 will be the crossroads that allows rapid progress to be made, and signal the true commencement of the Age of Light. Each of you have been selected to be here for such an occasion and for many of you life will suddenly offer you the changes that you have been seeking. As Lightworkers you each have something to offer that will be utilised at the right time. So do not worry or feel that your contribution is little compared to others, as all are important to the whole. You have all come a long way with your experiences and are greater for them than you were when you first started your journey. No experience is without value and there is no need to make comparisons with others, as you all have a unique individual life plan. No One is any greater or lesser than another soul. You are part of a great family that looks up to the Father/Mother God from whence you came. When you come together as One, there will no one soul considered better than another, as all tread the same path and are simply at different stages upon it. When you can see yourself in others you will know that you are inexplicably linked and in reality are One. Yet even as you progress to this understanding, you will still remain an individual Light amongst all others. When you are referred to as “Gods” it is a state of Oneness that you experience when you return to the Godhead. For the want of a better expression it is your Home from whence you came, and when God desires to experience some more, all souls will be sent out again for that reason. At this time you have difficulty in imagining or remembering your higher states of being, but soon you will be on the path to full recognition. It will happen by stages and first you will gain full consciousness. Of necessity you have lived out many lives in the lower vibrations with a limited consciousness. Your challenge has been to find your way back to God through your own experience, which is why each soul travels at its own speed and are on different paths. Remember also that for specific incarnations you are connected to certain energies that will enhance your opportunities to succeed. As you become more at One with the Light, so you will become more awakened to the truth of your real selves. You are not your body and it only serves your needs whilst on Earth. Yes, you also have an etheric body that is refined to allow existence in the higher vibrations, yet you have much further to go. Eventually you will become a true Being of Light, but you can still create a “body” for yourself when the necessity arises. It is worth noting that when you do so to allow movement through the lower dimensions, it will be limiting in other ways. Dear Ones throw off any feelings of tiredness or doubt, as the vibrations are increasing and you are being rejuvenated. Lift up out of doubt or disbelief and look straight ahead and walk in the Light. Leave your worries behind you and be assured that everything is in perfect order. It may be hard to do, but you must start unloading your “baggage” as you cannot take it with you into the higher realms. Think big and positive as you have done the hard work to have reached this point in your evolution. Also bear in mind that you have many souls with you on your journey, doing all they can to guide you onto a safe and rewarding path. I am SaLuSa come again to reassure you that all is well and we are with you all of the way. Our Love and Blessings go with you.